Can you feel the feng shui? Born and raised in Tokyo, I have seen many changes made to this high-tech city over the past 40 years. I remember, at the age of five, being surprised on my first visit to the Tokyo Tower observatory, and looking down on the sprawling metropolis; the people below looked like ants and the cars like grains of rice. But Tokyo Tower—for many years a popular spot for visitors and residents alike—is now dwarfed by Tokyo’s newest landmark, the 634m Sky Tree, that was officially opened on 22 May. In terms of feng shui, practitioners usually consider a high building to be equal to a mountain, but the Sky Tree is more similar to a thin stick. Creating a shadow on the ground, the Sky Tree affects feng shui and the natural environment in Tokyo more than we might imagine. Located in downtown Tokyo, the Sky Tree overwhelms this lowland area—that lacks tall buildings, mountains and hills—creating a shadow on the ground, strong winds and changes both in the movement of clouds at heights above 500m and wind flow, although the latter is not often felt on the ground. A narrow triangular shape with sides that reach to a height of 70m, the Sky Tree resembles a thin metal nail. Such “sharp” buildings are known to generate bad energy, termed poison arrows, which they radiate to surrounding areas. If the Tree can be seen from your home or office, plants should be placed in front of the window to cover the view, or a multi-faceted crystal should be hung to reflect the bad energy. Located in Tokyo’s north-east, the area represents—according to bagua—luck in education as well as good fortune in media and communications. The tower thus enjoys favourable conditions in terms of digital broadcasting. Not by coincidence, Yushima Seido—Japan’s first educational institution, built in 1690—also stands in the north-east of the city. Flying star feng shui—an advanced feng shui discipline—suggests a 180-year time cycle of nine periods. From 4 February 2004 to 3 February 2024, we are in period eight, with a central direction of exactly north-east. 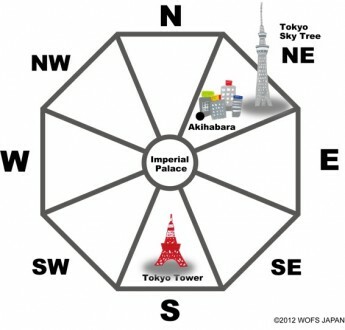 Were the new tower to activate the energy of this area through its many visitors, it would be most auspicious. Prior to 2004, Akihabara, in north-east Tokyo, was solely known for its electric appliance stores. But since 2004, culture from Akihabara—otaku, anime and the J-pop idol group AKB48—has been sweeping across the entire country, clearly demonstrating the power of period eight. The main colour of the Sky Tree is white, with just the barest hint of blue, that is officially called Sky Tree white. The elevator shaft is grey, the observatory metallic, and the top section vivid white. These colours, an expression of the feng shui element metal, release earth energy in a north-easterly direction. At night, when the tower lights are switched on, the element expressed is fire. Since fire produces earth, this brings good fortune and happiness. The many visitors to Tokyo Sky Tree from around the world will bring refreshing, active energy to the area that will counter any negative activity. I believe that Tokyo’s new tower will help Japan overcome the damage caused by the March 2011 triple disaster, thereby helping the country grow.